Known as Día de los Muertos in Mexico, the Day of the Dead is a holiday that is celebrated throughout Mexico. This three-day holiday is a celebration of the lives of those departed family members—and the love we still hold for them. It is apparent that some form of Day of the Dead was celebrated in pre-Hispanic culture before the arrival of the Spanish conquistadores—with some archaeological evidence that it could date back 3,000 years. However, scholars have traced the roots of Día de los Muertos to an Aztec festival which honored Mictecacihuatl—the Aztec goddess of the underworld, who is also called “The Lady of the Dead”. 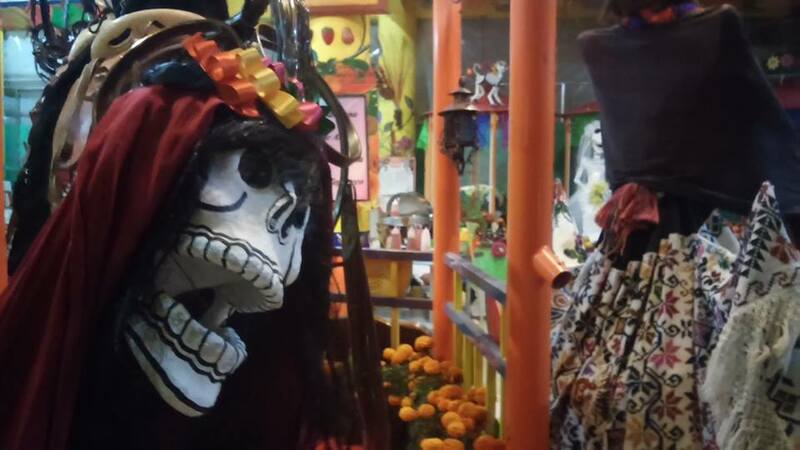 This goddess is likely the inspiration behind La Calavera Catrina. Originally, it was celebrated during the ninth month of the Aztec calendar—roughly the beginning of summer—in what is today Southern and Central Mexico. It was only after the arrival of the Europeans that the dates were changed to coincide with the triduum of Allhallowtide—which already celebrated the dead during All Saint’s Eve, All Saint’s Day, and All Soul’s Day. It is from this root that we get the name All Hallow’s Eve which would eventually become known as Halloween. The Spanish had their own influences on the Day of the Dead from their native festivities, including parades and filial gatherings at cemeteries for ritualistic prayer. It was not until the 20th Century that Día de los Muertos was celebrated in northern Mexico, because the indigenous people in the north observed Allhallowtide much like the rest of the Catholic world—without the amalgamation of pre-Hispanic elements. It was not until 1960 that Día de los Muertos became a national holiday due to unifying educational policies throughout the country. The first day of Día de los Muertos is October 31st—or what is most commonly referred to as All Hallow’s Eve in English. It is on this day that ofrendas (sometimes called altares or altars) are often displayed in one’s living room or den. Tradition has it that these altars draw the attention of lost family members and loved ones on this day—preparing them for the long journey from the underworld to the world of the living. Afterward, according to tradition, the family heads to the cemetery where they pack a picnic to enjoy by their loved one’s graves. They will play music, clean and decorate the difuntos’ graves, and some will even spend the night by their departed’s graves to be the first to welcome them when they arrive on the second day. Their children arrive first. The second day is Día de los Inocentes (Day of the Innocents). It is also called Día de los Angelitos (Day of the Little Angels). It is on this day that Mexicans believe that any lost children arrive again. Toys are brought for the children to play with, and candies or other sweets are left out for them to be enjoyed. Some practitioners believe that the departed eat the spiritual essence of the food, then other members of the family can eat the physical foods afterward. The third day is Día de los Difuntos, also known as Día de Muertos, where the adults return from the grave. On this day, the family members are said to visit the land of the living. 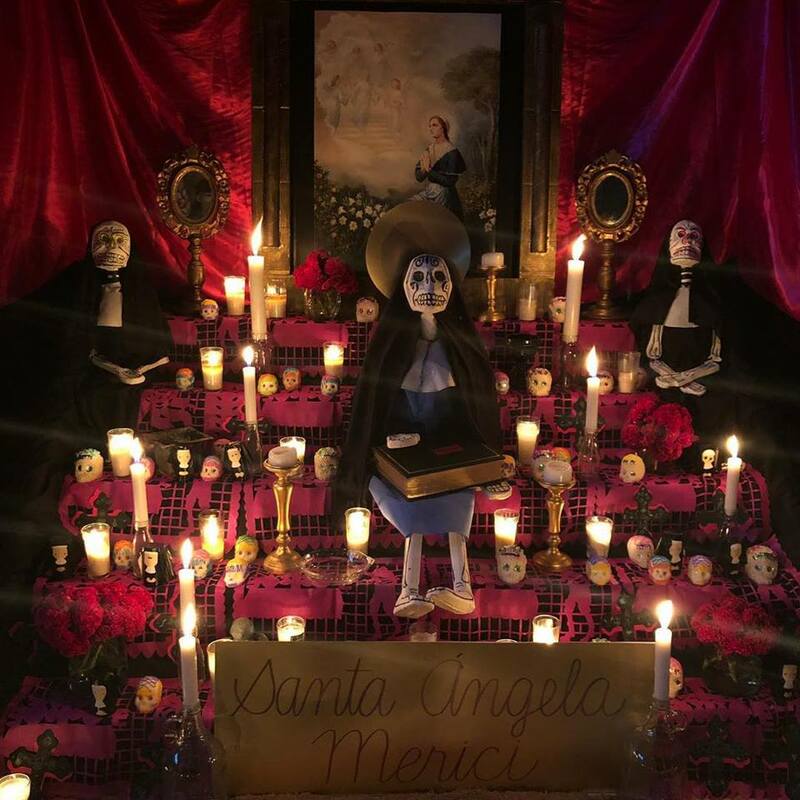 In different parts of Mexico, people passing by are invited to view the altar and drink mezcal or atole, and guests often contribute by laying a flower at the altar or contributing with some form of food or drink to the social gathering. La Calavera Catrina is an iconic zinc etching by the illustrator Jose Guadalupe Posada made in 1910. This image depicts a female skeleton wearing a festive hat. La Calavera Catrina has become a referential image of death in Mexico—especially Día de los Muertos. To learn more, click here. One lovely town to spend Día de los Muertos is Tepoztlán in the state of Morelos. This Pueblo Mágico is a wonderful place to see the festivities. 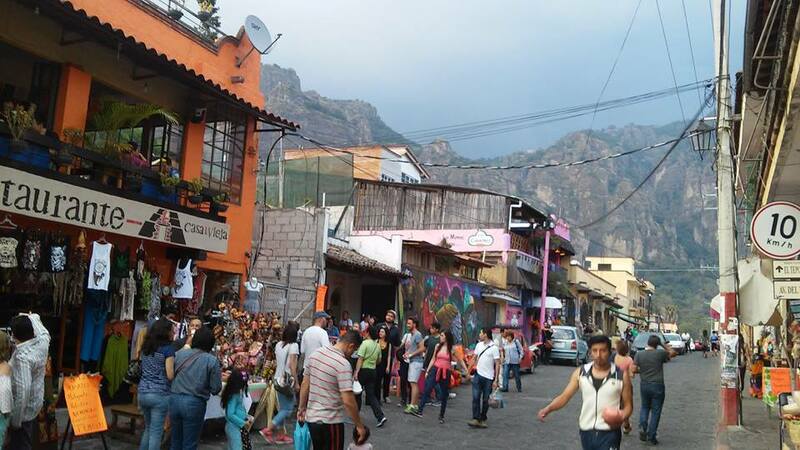 The village comes alive with the aromas of pan de muerto and burning copal, as people are dressed in traditional gear while they traverse their main street, the Avenida Tepozteco. This is the road that heads up the mountain to the small Aztec pyramid which overlooks this lovely town. Most houses will put up decorations and invite curious travelers to view their family’s altar. Tourists should approach with great respect. Offering a small token like a flower or some libations can go a long way to smooth relations so that you feel welcome. Paper streamers festoon the streets while the sounds of festivities fill the air. However, walking around some of the less touristic churches off the main street can reveal some of the most unique cultural experiences I have ever encountered in my years of traveling through Mexico. I remember in Tepoztlán a couple years ago for the Day of the Dead celebrations, my cousin Oskar and I passed by a Catholic mass. Throngs of people were crowding not only the church and the courtyard outside, but the mass had spilled out into the street. We rolled by to get a look at what was happening inside the church, and those out on the street warmly urged us inside. It seemed like any other catholic mass except on the altarpiece where Jesus’ figure normally stood, the figure of Jesus was covered in a black shroud and wearing a mask with the image of an intricately decorated skull. 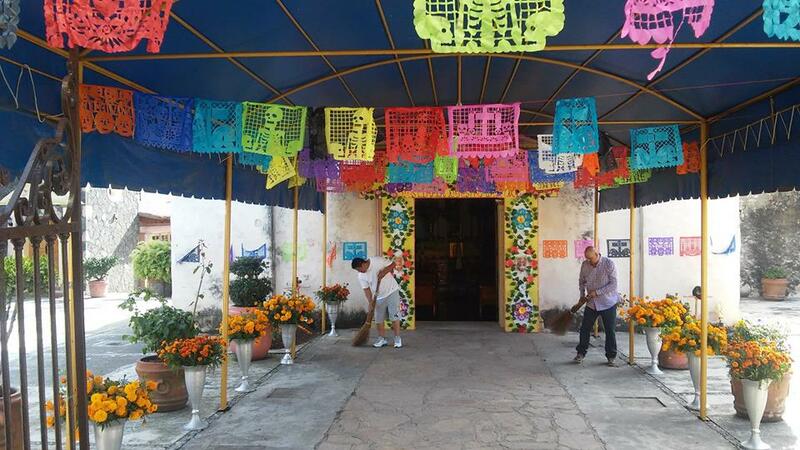 These unique rituals are precious examples of the synthesis of Catholic Mexico with pre-Hispanic indigenous cultures. Few places are better for catching a glimpse of the native rites and truly experiencing the Day of the Dead than Tepoztlán. Candles – Candles were already associated with departed family members in the Catholic religion. It is common to include one candle for each member, and an extra candle for the “forgotten soul”. Candles can be placed in a particular shape like that of a skull or a cross. This is a symbol for the element of fire. Pictures of Difuntos – Placing a visual element can draw the focus of the spiritual veneration of those in the presence of the ofrenda. It is often a framed picture of the departed, but it does not always have to be. It can be a loose photograph or even a drawing. Flowers – Traditionally, they are cempasúchil (also known as zempoaxochitl in Nahuatl). These flowers are not only typical for their bright orange color, but also for their unique smell which is said to attract the dead to the house of the living. Sometimes they are placed in a path from the doorway or even sidewalk to attract the dead. Other colorful flowers can be placed with the cempasúchil flowers, and these can be placed in shapes as well. Salt – Salt is often placed at an altar as a symbol of purification. Copal – Traditionally, Copal is burned. This is a resin with a very aromatic smoke. If this is not available, incense or aromatic herbs like chamomile, rosemary, and sage are burned as a substitute. These are said to attract loved ones from the land of the dead to that of the living. Papel Picado – These decorations are made with brightly-colored tissue paper which are cut with festive designs, or even shapes like skulls. These are hung around the altar and throughout the house. These are often associated as an elemental symbol for air. Elemental Symbols – There are often symbols of the four Aristotelian elements: fire, earth, air, and water. These symbols are represented by objects such as candles or veladoras to represent fire, or paper decorations which blow in the wind to represent air. Fruits can be placed to represent earth, and a glass of water is not an uncommon sight as well. Skulls – The classic depiction of skulls are a must for any ofrenda. These decorations often serve as a reminder of the transience of life and flesh, and the permanence of death. They can be plaster skulls, or they can be made from edible materials such as sugar, chocolate, or amaranth. They can be homemade or purchased, simply decorated or fantastically elaborate. They will often carry the name of departed friends and family members. Pan de Muerto – This bread is as varied as the regions that celebrate the Day of the Dead. Sometimes it is served in a circular shape with a protrusion which is meant to symbolize a skull, or four strips of dough atop it which represent bones. These could possibly carry with them pre-Hispanic symbology—dating back to an Aztec bread that was made with the blood of human sacrifice. Most breads are sweet, encrusted with red or white sugar on top, or sesame seeds, or the dough can sometimes be worked with walnut, orange zest, anise, or fig. Some breads are savory, however, and they are often worked in the shape of human figures, skulls, or rabbits. To learn more, click here. Items for the Dead – Often items are left for the difuntos such as traditional foods like tamales, mole chicken or turkey, and pozole—whatever the departed liked. These are often left in cazuelas or other clay pots. Fruits are generally included as well. These items are generally consumed by the family members after the dead have had a chance to eat, though superstition has it that the nutritional value has been removed from the foods. Other items are left behind for the departed, such as cigarettes if they smoked or mezcal if they drank. Dominoes or cards can be left for entertainment, and blankets and pillows can sometimes be left out for the family to sleep. I’m from Tepoztlán. Thanks for visiting my beautiful town!